If you have already completed the Free Application for Federal Student Aid for the 2017-2018 academic year, simply go to: Federal Student Aid website, click the green login button and then add Lycoming College as the school you plan to attend. If you have not completed the Free Application for Federal Student Aid, first, students should go to the Federal Student Aid website and get a FSA ID. One parent of a dependent student must get an ID as well at this site. IDs are used to electronically sign the Free Application for Federal Student Aid (FAFSA), which is mandatory for successful completion of the application. IDs are usually available to use within 48 hours after applying for them. Keep track of the ID, as you will be using it throughout your college career. When completing the FAFSA, be sure to list Lycoming College. Begin applying today! The Federal School code for Lycoming is 003293. First, students should go to the Federal Student Aid website and get a FSA ID. One parent of a dependent student must get an ID as well at this site. 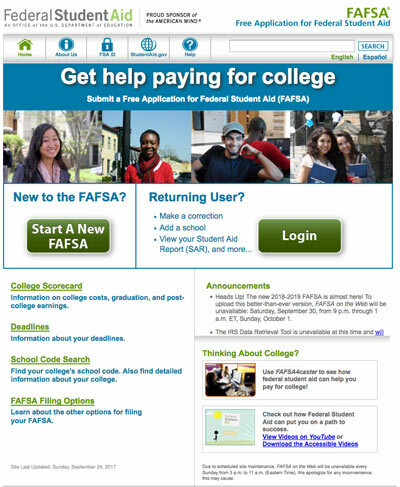 IDs are used to electronically sign the Free Application for Federal Student Aid (FAFSA), which is mandatory for successful completion of the application. IDs are usually available to use within 48 hours after applying for them. Keep track of the ID, as you will be using it throughout your college career. Use the IRS Data Retrieval Option for both the student and parent(s). Using this option will speed up the entire process and will help eliminate common mistakes. The FAFSA application is the only application Lycoming College requires in determining financial aid eligibility. The Lycoming Financial Aid Application (LFAA) is no longer required.